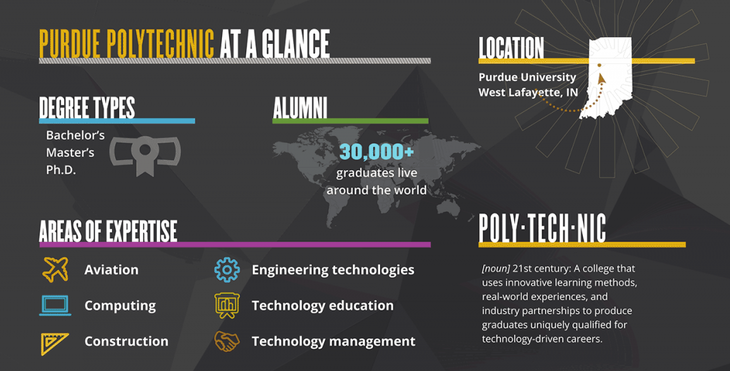 Whether delivering a transformed learning experience to produce industry-ready graduates who have the skills for today’s economy or conducting use-inspired research to advance the evolution of technology and solve real-world challenges, the Purdue Polytechnic Institute aims to be a global leader. Purdue Polytechnic was founded in 1964 as Purdue University’s School of Technology. It was renamed College of Technology in 2005, and in 2015, the Board of Trustees approved its current name in support of the college’s transformation and as part of President Mitch Daniels’ Purdue Moves initiative. Mission To inspire, educate, and mentor students through learn-by-doing and integrated study, preparing graduates for success as future technology innovators and industry leaders; and to advance trans-disciplinary learning, engagement, and use-inspired research addressing important state and global challenges. Vision We are a transformational college unbounded by tradition ... Pioneers of learn-by-doing and use-inspired research. Statement of Integrity and Code of Conduct At Purdue and the Purdue Polytechnic Institute, integrity is indispensable to our mission. We act with honesty and adhere to the highest standards of moral and ethical values and principles through our personal and professional behavior. We demonstrate our understanding of these values and principles and uphold them in every action and decision. Trust and trustworthiness go hand in hand with how we conduct ourselves, as we sustain a culture that is based upon ethical conduct We expect our actions to be consistent with our words, and our words to be consistent with our intentions. We accept our responsibilities, share leadership in a democratic spirit, and subject ourselves to the highest standards of public trust. We hold ourselves accountable for our words and our actions. We uphold the highest stands of fairness, act as responsible citizens, respect equally amidst diversity, preserve the rights of others, and treat all individuals with dignity. To fulfill our goals as a learning community, we insist that the objectives of student learning are not compromised. We treat all students equitably, and our evaluations of learning achievements are impartial and based solely on demonstrated academic performance. As a land-grant institution, we demonstrate our responsiveness to our constituencies and extend to them access to our knowledge resources. We pledge to make wise use of our resources and to be good stewards of financial, capital, and human resources. The Purdue Polytechnic Institute is responding to the changes in our students and society — we are transforming our learning environment to better serve their needs. Purdue Polytechnic’s unique learning environment is defined by a combination of 10 key elements. THEORY-BASED APPLIED LEARNING We start by studying the theory, then we apply it . . . we really apply it. Learning by doing is the foundation of Purdue University’s Polytechnic learning experience. It’s a powerful and proven approach that drives students to better understand and retain concepts. TEAM PROJECT-BASED LEARNING Companies and communities rely on teamwork to achieve success. We practice it. From the first semester to the last, team projects are a cornerstone of Purdue Polytechnic programs, exposing students to team dynamics, deadlines, and problem-solving techniques. MODERNIZED TEACHING METHODS Why do classes have to be taught by an instructor lecturing in front of a classroom? They don’t. More and more of our courses employ research-proven, state-of-the-art teaching methods known as active learning. It’s different, fun, challenging, and more effective. INTEGRATED LEARNING-IN-CONTEXT CURRICULA Students learn more readily when 1) they have a deep understanding of the purpose of their learning, 2) their learning occurs just in time before it is needed, and 3) the learning outcomes are tied to practical experiences. Our courses follow these pillars of purpose, timing, and practicality. INTEGRATED HUMANITIES STUDIES The integration of technology studies with humanities and social science studies improve student critical thinking, creativity, logic, and innovation. Polytechnic students graduate with these skills and are well prepared for a lifetime of learning and success. COMPETENCY CREDENTIALING Students demonstrate mastery of concepts and applied skills (known as competencies), enjoy the flexibility to focus on their interests while learning at their own pace, and build e-portfolios to showcase their capabilities. Purdue is a leader in competency-based learning. SENIOR CAPSTONE PROJECTS Real projects with real clients benefit students, companies, and communities. Purdue Polytechnic programs include senior capstone projects that allow students to apply what they have learned to solve real-world challenges selected by corporate and community partners. INTERNSHIPS We don’t simply encourage students to pursue internships – we embed them and other workforce-like activities into our programs. In the summer or during the semester, students use these opportunities to expand their knowledge and skills and set the foundation for future employment. GLOBAL/CULTURAL IMMERSIONS The world is shrinking while our global and cultural opportunities are growing. Boasting a multicultural learning environment filled with faculty, staff, and students from over 100 countries, Purdue PolyteAchnic also offers an enriched perspective through study abroad, international internships, and other global and cultural activities. FACULTY-TO-STUDENT MENTORSHIP College students are more successful when they have someone who takes a special interest in their aspirations and progress. Our students have the unique opportunity to have a faculty member assigned as their mentor, steering them toward success by providing professional guidance and support throughout the school year. If you’re looking to advance within the challenging, specialized world of aviation, Purdue’s Graduate Certificate in Aviation Safety Management will help you gain knowledge to develop, lead, and execute effective aviation safety programs. Taught by professors with distinguished educational backgrounds and work experience in civilian aviation, military aviation and governmental roles, our industry-specific courses will prepare you for numerous aviation roles. Gain knowledge of the foundations of construction management. This knowledge will help you apply the theories and principles of construction management to effectively identify, analyze, and manage construction operations within your organization. With a graduate certificate from Purdue University, professionals will learn to analyze techniques for contemporary construction business practices including accounting and finance practice, legal obligations, rights and remedies pertaining to construction company bidding, contracts, and construction changes, risk management, and marketing theory and process. The Information Technology Business Analysis graduate certificate program will provide graduate students introductory graduate-level education in the important aspects of Business Analysis. The certificate program will provide professionals with the knowledge of how to determine business requirements that drive IT-related projects. In addition, it will help them identify, analyze and design processes to improve the overall flow of information within their organization. The Managing Information Technology Projects graduate certificate program will provide graduate students introductory graduate-level education in the important aspects of leading, planning, executing, and controlling IT projects. This certificate program will provide preparatory level skills to support the success of complex, cross-functional IT-related business initiatives. If you’re looking to advance within the challenging, specialized world of aviation, Purdue’s MS in Aviation and Aerospace Management will help you develop essential management and leadership skills. Taught by professors with distinguished educational backgrounds and work experience in civilian aviation, military aviation and governmental roles, our industry-specific courses will prepare you for numerous aviation management roles. Set yourself apart with a superior credential with a Master of Science (MS), focused on IT Business Analysis. This 100% online MS features an IIBA® & PMI® based curriculum and provides the flexibility needed by today's working professional. Business analysts play a vital role bridging business and IT functions of an organization. Their ability to understand the business domain and translate those needs to technical people in terms they can understand is vital to the success of any project initiative. Manage your way to a better career with a Master of Science, focused on IT Project Management, to meet industry/business requirements in this dynamic field. Learn tools and techniques you can apply to every phase of the project lifecycle. This 100% online program features material included in the Body of Knowledge developed by the Project Management Institute (PMI®) —including requirements discovery and management, schedule development and management, portfolio management, and management of outsourced resources.